Golf in Ireland, nature has provided wonderful raw materials for the greatest golf architects in the world. They have responded to this inspiration by designing some of the world’s finest golfing challenges and establishing Ireland as a prestigious golfing destination. Not only are the courses themselves both spectacular and challenging, the stunning scenery which surrounds them is positively breathtaking. Ireland can be divided into four distinct golfing regions and we now invite you to come along with us and enjoy a flavour of our premier courses in the following pages. Learn about the various regions by selecting from Northern, Southern, Eastern, and Western . 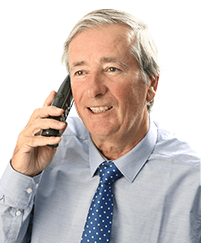 Alternatively to view a map of the entire island of Ireland and its leading Golf Courses. 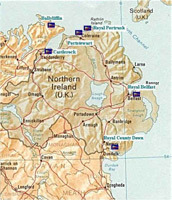 The Northern Ireland region includes the counties of Donegal, Antrim & Down. The special courses in this region include the highly rated Ballyliffin described by Nick Faldo as ‘the most natural course ever’. Continuing around the island clockwise is the trio of the World’s best links, the Dunluce Course at Royal Portrush, Portstewart and Royal County Down which are Northern Ireland’s premier links courses. Other courses not to be missed in this region are Castlerock and Royal Belfast. The South West region includes the counties of Kerry, Cork, Limerick and Clare. In County Kerry you can play the world renowned Ballybunion Old and Cashen courses. Within a short distance of Ballybunion is the Arnold Palmer designed links course at Tralee. On the tip of the scenic Ring of Kerry is the superb Waterville Golf Links. Two other links well worth playing are Dooks and Ceann Sibeal in Dingle. A visit to Kerry would not be complete without including Killarney Golf & Fishing Club, home to two Irish Opens and the 1996 Curtis Cup. County Clare is home to the world renowned Lahinch and Doonbeg Championship Courses which attract thousands of golfers every year from all over the world. In County Limerick you can play Adare Golf Club. This Robert Trent Jones designed course is set on the grounds of Adare Manor and offers a very enjoyable round of golf. County Cork is home to the spectacular Old Head of Kinsale Links set hundreds of feet high above dramatic cliffs surrounded by the ocean on all sides. Fota Island, host to the Murphy’s Irish Open 2001 and 2002 sits tranquilly in Cork Harbour, a few minutes drive from Cork City. 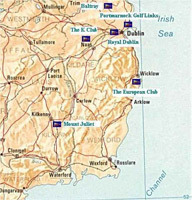 The East Coast region includes the counties of Dublin, Louth, Kildare, Wicklow and Kilkenny. Dublin, the Capital of Ireland is not only a sophisticated and friendly City but is also endowed with world rated golf courses. The links courses include world famous Portmarnock, home to many Irish Opens and also the 1991 Walker Cup. 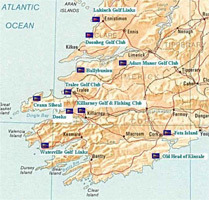 Royal Dublin is built on a man-made island close to the lesser known but wonderful Island Golf Club. County Louth Golf Club, Baltray, one of Ireland’s golfing gems, offers a wonderful links experience. This course is close to Dublin or can be enjoyed en-route to Northern Ireland. County Kildare is home to Arnold Palmer’s second golf creation, the K Club at Staffan. This inland course is host to the Smurfit European Open and was the venue for the 2006 Ryder Cup. The European Club in Co. Wicklow is a links course situated twenty miles from Dublin and worth a visit. Druids Glen is a fine parkland course set in the wooded countryside of Co. Wicklow and has hosted the Murphy’s Irish Open in 1996, 1997, 1998. A short distance from Kilkenny City lies the Mount Juliet Estate and golf course. This Jack Nichlaus designed course hosted the 1993, 1994 and 1995 Irish Open and the 2001 American Express World Golf Tournament won by Tiger Woods. 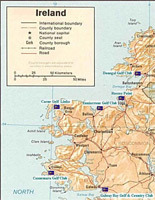 The West Coast Links region includes the counties of Galway, Mayo and Sligo. The special courses in this region are the highly rated Donegal Golf Club Murvagh described by Golf World as a ‘sensational links’ while the County Galway is home to the challenging links of Connemara Golf Club, where they say the par 72 is rarely achieved. Galway also includes the course, Galway Bay Golf & Country Club, designed by Ryder Cup player and Tour Professional, Christy O’Connor Jnr. While a modern parkland this course has a destinctive links feel about it. In County Mayo you can play Carne Golf Links in Belmullet which is an exciting links in a very natural setting of considerable beauty. Enniscrone Golf Club in County Sligo is often referred to as one of Ireland’s best kept secrets, a true Irish links gem. The County Sligo Golf Club, Rosses Point, is one of Ireland’s best celebrated links courses. With brisk winds off the Atlantic Coast, nothing is more challenging than a round at Rosses Point.